The Star Trac Pro Upright Bike comes with a personal fan to keep you going strong during intense workouts, Dynamic Heart Rate Control to adjust workout to your own heart rate, and a durable corrosion-resistant frame that will keep you staying in shape on this bike for years to come. 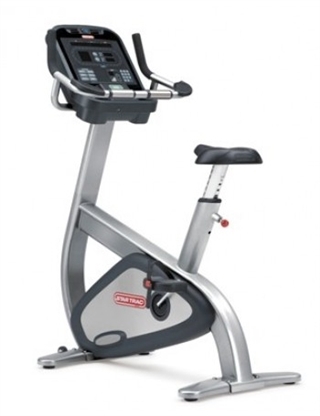 Following our line-up of user-focused cardio equipment, the bike boasts a distinctive design, and user-preferred features like easy-up seat adjust, and dual-sided pedals with inline skate style straps. Add Star Trac's personal programs specially developed for bike riders, and you have the best upright bike designed with your members in mind. Heart Rate Monitoring	: Polar Telemetry and Contact Heart Rate System with Dynamic Heart Rate Control.